It's hard to believe, but summer is almost upon us! Soon the days will be warm and we'll spend our days by the pool. While we might enjoy every second, our curls can suffer from too much time spent in chlorine and salt water. However, there are things you can to help keep your curls safe and damage free. Here's how to protect curls when swimming. Give these great suggestions a try and let us know what you think. Before jumping into the deep end, take a minute to protect your strands. A protective style can help keep curls from over exposure to the water. 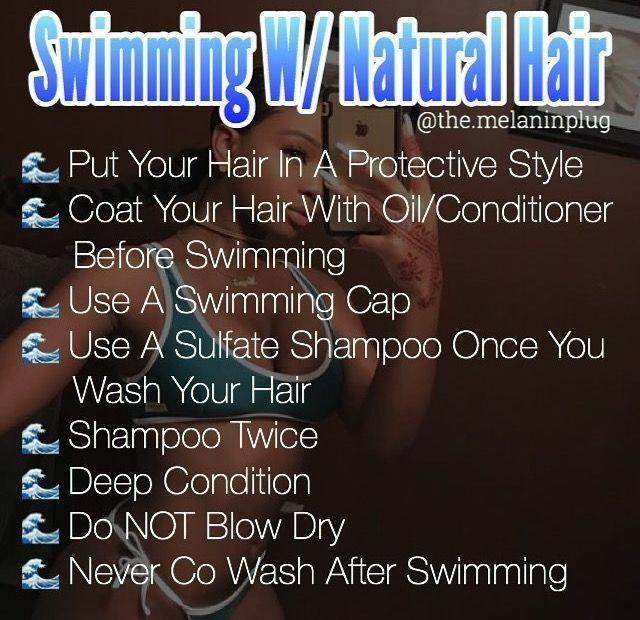 Before getting in the pool, coat your hair with a leave in conditioner or oil, and then braid strands. Tie with a soft cloth hair tie to prevent damage to your ends. Avoid pulling your curls too tightly, as this can lead to breakage and strain at the scalp, which will minimize growth. While a swimming cap isn't the epitome of sexiness while at the pool, it will help protect your strands from the harsh chemicals. Seek out a cap with a vintage flair, and enjoy some old fashioned vibes! The cap will keep your curls from being affected by the chlorine and is ideal for those who expect to spend a lot of time in the pool. After you've been in the pool, make sure to follow up with a shampoo with a sulfate free shampoo. This will make sure to remove any residue left behind by the pool or the salt from the sea. If you're regularly taking a dip, you might also want to use a clarifying shampoo every week or other week depending on your curl's needs. Additionally, skip the cowash after swimming. Utilizing a cowash is usually quite helpful but in this case won't get your curls clean enough. If you're the type to skip out on your deep conditioning treatments, don't do it over the summer. Your curls will need all the extra TLC they can get, especially after time spent by the pool. Avoid excessively heavy products in favorite of lightweight, highly moisturizing conditioners. Cover curls with a towel and allow the product to sit for 30 to 60 minutes before rinsing away.